Add alcohol and stir lightly. Pour in iced tea. Stir a few more times and serve. Note: Add a splash of lemon and garnish with a twist for a classy drink or serve in a mason jar for a real down-home feel. While checking in with friends about their weekend plans I was finding that we seem to be the only family staying in town for the 3-Day weekend. So, what are your plans for Memorial Day weekend? Anything special? - Six different seasoning flavors. 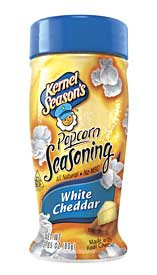 1) Visit the Kernel Seasons website and find some popcorn seasonings that sound good. Return here and leave a comment telling me which flavors you like. = 1 Entry. 2) Announce the VGNO Kernel Seasons giveaway in the Twitter world! = 1 Entry.